Spring to a gardener is like honey to a bee. We eagerly wait for spring all winter. Gardening books have been read, magazines have been scoured (evident by dog-eared pages), photos clipped and notes made. Just as making a gourmet meal, garden preparation and planting includes a well thought out plan – like a recipe. 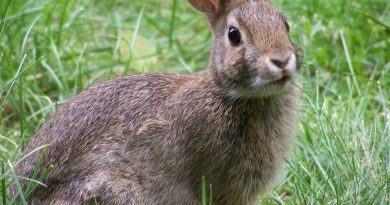 Emphasis is always placed on summer and fall, leaving the early performing gardens somewhat overlooked, neglected or underrated. 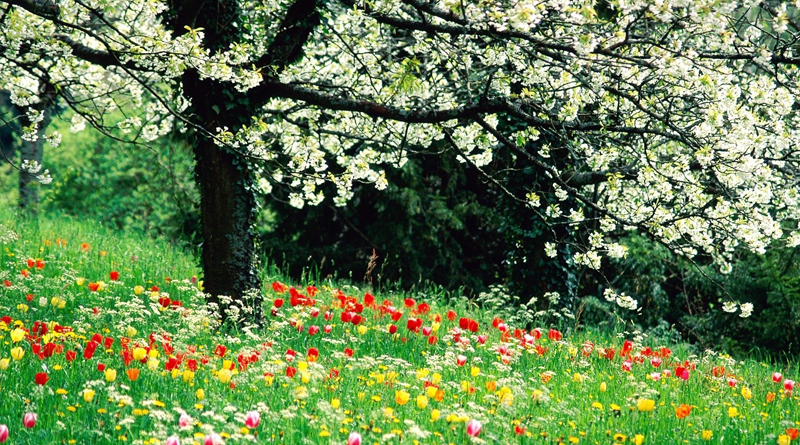 Spring is the opportunity to be in the garden, cleaning and clearing, so why not create a spring garden filled with blooms so we can enjoy them during this season? Have you watched a spring garden unfurl itself from a winter’s rest? 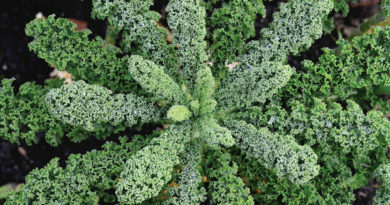 These plants have an uncanny ability to endure cool soils. Warm rays of sunshine through leaf-less tree canopies gently warm gardens nestled in shady areas, bringing life to early blooming plants that normally reside in shady locations during the heat of summer. 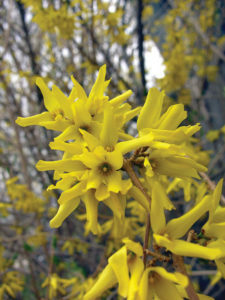 Early spring plants possess the endurance to grow in cool temperatures and produce blooms. It is these select varieties that enable a gardener to create a garden for all seasons, including the start of the season – spring. The colour pallet for early spring generally is soft and delicate with shades of rose, yellows and blues. Bergenia, also known as elephant ears or pig squeak, looks magnificent as the snow melts revealing their large lobed, waxy leaves, seemingly untouched by our winter’s cover. Slight brushing of its foliage quickly clears any show of winter damage. 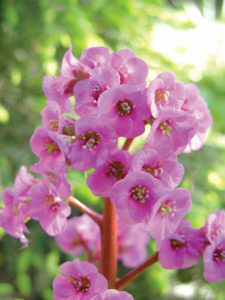 Bergenia waits patiently for the first warming days to produce its early show of striking pink-to-rose drumstick blooms. 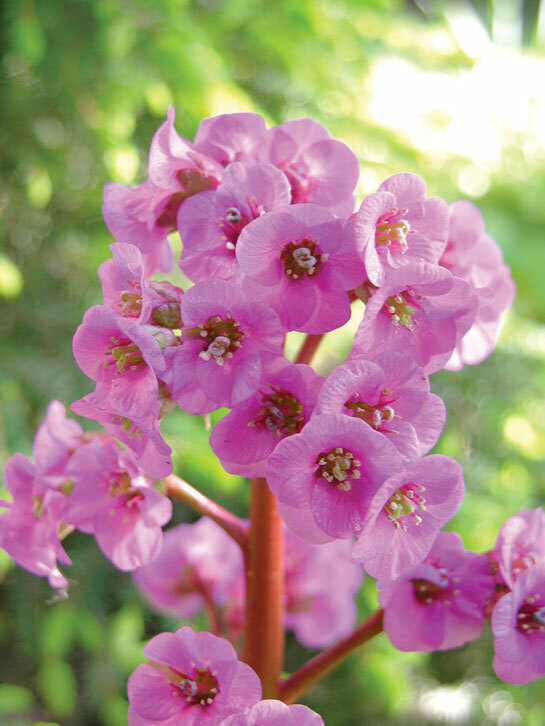 Bergenia ‘Eden’s Dark Margin’ leaves have a darker colour to the foliage, emphasizing the contrast with their flowers. Larger clumps may be used as specimen plants but they also look spectacular when planted en-mass in shade to early-morning-light conditions. From a distance some may think the variegated brunnera look similar to hosta, but up close the differences are evident. 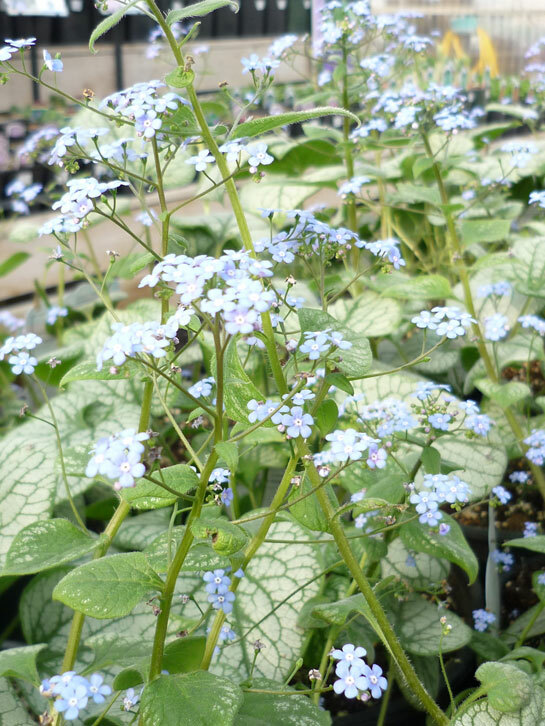 Unlike hosta’s soft-ribbed leaves, brunnera has a fuzzy, brush-like texture to its heart shape. Patterns of silver overlay a crisp green color of these mounding plants. Different, too, is the bloom. Delicate airy clusters of minute sky-blue blooms are held on thin wisps of stem above the foliage. Brunnera ‘Jack Frost’, Perennial Plant of the Year 2012, is favourable to shady areas. 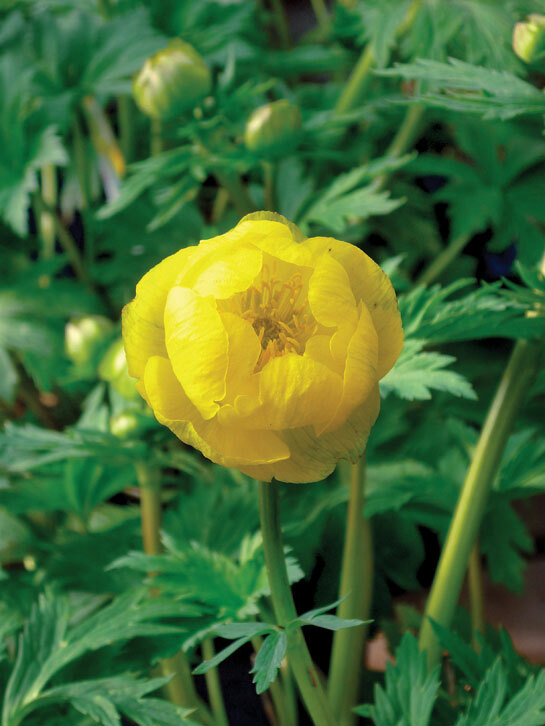 Trollius, commonly known as globe flower is a member of the Ranunculaceae family. Varieties include ‘Superba Yellow’, ‘Golden Queen’, and ‘Lemon Queen’. It is truly a favorite for spring bloom. Bright green foliage with palmated leaves are dressed with dancing yellow or cheddar orange globe flowers reminiscent of roses. 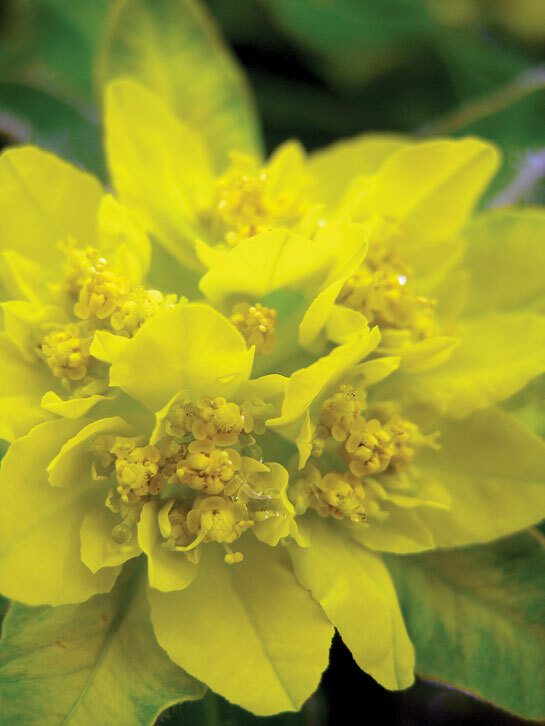 Striking yellow blooms coat the stems of this shrub from base to tips. 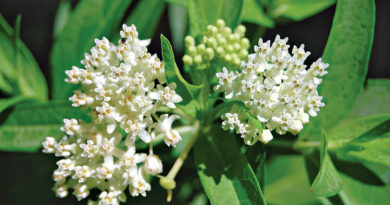 Blooms burst forth prior to any signs of foliage. Like the tulip, forsythia may begin its blooming pattern with warming weather even when snow may still be evident. Forsythia v ‘Show Off’ spans five feet by five feet. These are just a few of my top picks for a spring garden – the starter course for spring color in the garden. 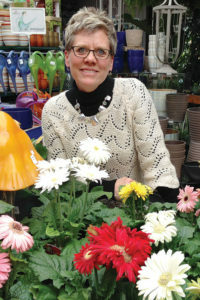 Many more plants, such as repeat blooming irises and creeping phlox with bold blues and pinks add to any garden recipe. For an appetizing effect to complement your spring garden, plant a welcoming container for your front entrance with cool-loving plants such as cyclamen, diascia, pansies paired with ivies. 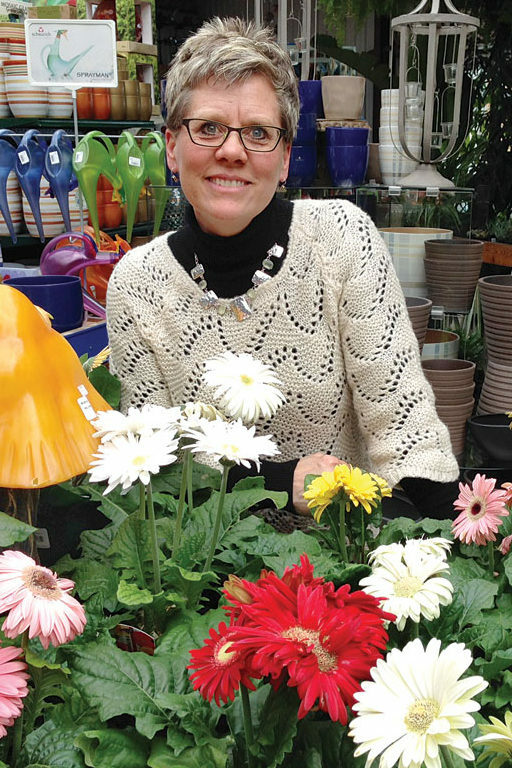 Story and photos by Carla Hyrcyna, owner of St. Mary’s Garden Centre. She spent many years as a grower.